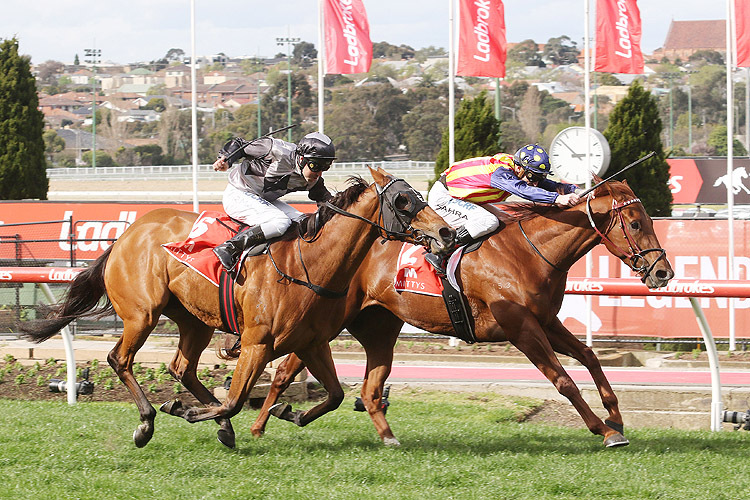 Highly-rated Nicconi sprinter Nature Strip smashed the track record for 1000 metres at Moonee Valley with his brilliant win in the G2 Ian McEwen Stakes on September 8. A sale ring reject, Nature Strip (Nicconi x Strikeline by Desert Sun) took his record to eight wins from 11 starts when he lasted to score by a nose after running sub-11 second splits between the 800m and 400m on his way to a record time of 56.95 seconds. His earnings are now close to $700,000 and within 24 hours it was confirmed that he would be running in the $13 million Everest at Randwick in October. Now unbeaten in four starts for Darren Weir, Nature Strip was passed in for $90,000 on a reserve of $120,000 when offered at the 2016 Melbourne Premier Yearling Sale. He is among 17 individual stakes winners by Nicconi while his dam Strikeline was a G3 winner and is a half-sister to fellow G3 winner Bashful Girl (Perugino). 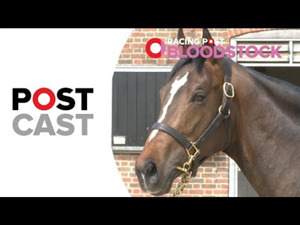 Strikeline has produced three other winners including the Listed Fernhill Handicap winner The Barrister (Star Witness), who now races in Hong Kong as High Volatility. Strikeline has an unnamed two-year-old sister to Nature Strip and a yearling colt by Shamus Award and was covered last spring by Savabeel. Nicconi was a winner of the G1 Galaxy and G1 Lightning Stakes during his 17-start career but is yet to produce a G1 winner. 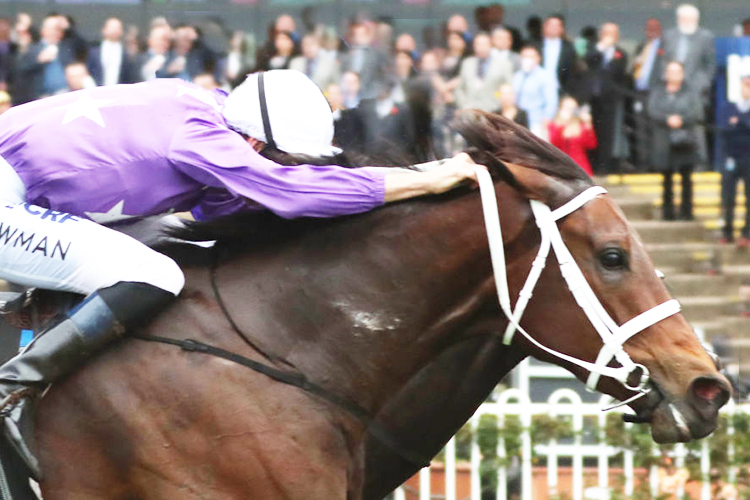 •	Classy 5YO mare Invincibella took her earnings past $1.2 million when she held off her Chris Waller-trained stablemate Noire to win the G2 Sheraco Stakes at Rosehill on September 8. Both mares race in the familiar purple and white silks of syndicator Denise Martin’s Star Thoroughbreds. Invincibella (I Am Invincible x Abscond by Galileo) has now won seven of her 28 starts. She is a half-sister to the stakes-placed Secret Blaze (Sizzling), and was purchased a yearling for $185,000 at the 2015 Magic Millions Gold Coast Sale from the Sledmere Stud draft. Invincibella is out of the unraced Galileo mare Abscond, a half-sister to the stakes placed Light Up Manhattan (Manhattan Rain), dam of two winners from her first three foals. Abscond is out of the winning Zabeel mare Luminata, a half sister to the G1 Adelaide Cup winner The Hind (McGinty) and Listed winner Oregon Star (Oregon). Race Synopsis: Although he had just a head to spare Nature Strip won the same race as both his sire (Nicconi in 2009) and dam (Strikeline in 2005) and is building an impressive record, this his eighth win and third stakes from only 11 starts. From the inside barrier he wasn't first into stride but soon sped along the fence to take a clear lead at the 800m. Jockey Mark Zahra sat quietly to the short straight, broke away by two lengths at the 200m and he looked in for a comfortable win only to be challenged strongly within the shadows of the post yet survived. Houtzen sat third (rails), took over second at the 400m, pulled out to challenge at the 200m but was making little impression until the last 50m where he almost caught the tiring winner, the first two stringing out the field. Shoals was fourth turning in then battled away to be three and three quarters further back in third from Viridine who flashed in fourth late but another two and three quarter lengths back.